Joe Quigley said he signed for Havant and Waterlooville because he wants to improve as a striker. 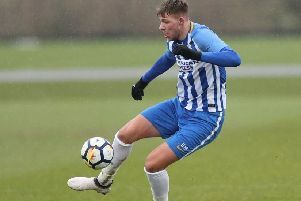 The former Bournemouth and Republic of Ireland under-21 international proved a popular figure at Priory Lane during his one-month loan spell from Bromley. Eastbourne Borough manager Jamie Howell was keen to keep Quigley until the end of the season but the forward opted for National League outfit Havant, which is closer to his home in Bournemouth. Quigley said, “I met the gaffer (Lee Bradbury) and the chairman last week. It took a bit of time but I’m pleased to get it over the line. “Lee being a former striker was a factor. I’m delighted to start work with him and hopefully he can improve me as a player.